I've been feeling nostalgic about my trip to Vienna last summer. Especially Sunday morning at the Cafe Hawelka, drinking milky strong coffee and eating warm-from-the-oven apricot pastries while catching up on the newspapers. This was the view from our booth. Pretty much perfect. 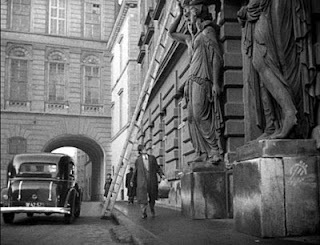 Later that afternoon, we saw The Third Man, one of my favorite movies, at the Burg Kino. Our pension was just down the street and around the corner from here.